Enter the top number of the fraction to be reduced and/or simplified. Enter the bottom number of the fraction to be reduced and/or simplified. This is the greatest common factor for the numerator and denominator you entered. If the result is one, it means that your entries do not have any factors in common other than one -- meaning no reduction or simplification is possible. But in either case, the fraction reducer calculator will still report its conclusions and show its work below this line. Plus, if the fraction is an improper fraction it will convert it into a mixed number. This is the entered fraction reduced to its simplest form. This simplify calculator will reduce fractions to simplest form in the blink of an eye, and even show its work. Plus, in addition to simplifying fractions, the calculator will also convert a simplified improper fraction into a mixed number. Enter the numerator (top) of the fraction to be reduced. Enter the denominator (bottom) of the fraction to be reduced. Click the "Reduce Fraction" button. This will display the generate the greatest common factor of the numerator and denominator and the reduced fraction, and generate a step-by-step explanation showing how the calculator arrived at the result. The process of finding common factors for the numerator and denominator of a fraction, and then restating the fraction as quotients of their common factors. The process is repeated until there are no more factors common to the numerator and denominator. At that point the fraction is said to be "in simplest form." What Does it Mean to "Reduce Fractions?" One of the concepts that is central to working with fractions in math is that as long as you perform the same operation on both the numerator (top) and denominator (bottom), you won't change the underlying value of the fraction. For example, if you begin the fraction 1/2, and multiply the top and bottom of the fraction by, say 5, you will not change the underlying value of the fraction no matter how many times you repeat the multiplication. Now, since 125/250 is the same as 1/2, 1/2 would be the simplified version of 125/250 (or 500/1000, 2500/5000, etc.). And since working with smaller numbers is easier that working with larger numbers, it always makes sense to reduce fractions to their simplest form before working with them. To use the trial and error method of simplifying fractions you just start by attempting to divide the numerator and denominator by a small number that you believe to a common factor to both (usually 2) and then continue to work your way up. After each successful reduction, you then need to repeat the process until the numerator and denominator have no other factors in common. To use the greatest common factor method of simplifying fractions you first need to find the greatest common factor of the numerator and denominator. Next you simply divide the numerator and denominator by their greatest common factor. Using the fraction 8/12 from above, we find that the greatest common factor of the numerator and denominator is 4. Regardless of which manual method you choose, using them to reduce fractions can be extremely tedious and time consuming. 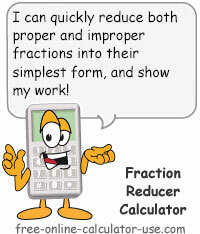 Therefore I would suggest you bookmark the fraction reducer calculator and use it any time you are working with fractions. An improper fraction is a fraction that has a numerator that is greater than its denominator. Typically, when you are asked to simplify fractions, and a simplified fraction turns out to be an improper fraction, you would need one final step before the simplification was considered complete. And that would be to convert the improper fraction to a mixed number (a b/c). To convert an improper fraction to a mixed number (the fraction reducer calculator does this for you), you first divide the numerator by the denominator. The number of full times the denominator goes into the numerator becomes the whole number, the remainder becomes the numerator, and the denominator remains unchanged. Here is how you would convert the improper fraction 5/3 into a mixed number.